Charles Lutz, Price List (Double Fantasy), 2010, acrylic on canvas, 80 x 113” overall. The silver-and-red pie chart in Charles Lutz’s painting New Values (Silver 2007) (all works 2010) indicates that contemporary art sales at the top two auction houses, Christie’s and Sotheby’s, reached $1.7 billion in 2007. Today, despite two and a half years of global recession, the art world barely flinches at sales in excess of $100 million. Critiquing the unrestrained spending and unabashed hype are Lutz’s glossy, detached works that combine the photographic silk-screen process of Warhol with the meticulous finish of Koons—artists whose oeuvres notoriously accommodate both supporters and detractors of commercialized art. By appropriating printed matter produced by auction houses from the 1970s to the present, Lutz presents a sociological picture of the art world that is impressive, puzzling, and occasionally self-evident. Most successful are four multipanel paintings that replicate and juxtapose official day-after summaries from Christie’s and Sotheby’s, with enlarged letterhead reports printed on uniform fields of green, pink, and blue. Although encrypted as lot numbers, gavel prices, and catalogue errata, works of art can be identified with sleuthing, which reveals interesting details. Price List (Double Fantasy) pairs a 2001 auction that gave Koons a personal best, at the time, of $5.4 million (his record has since quintupled) with a sale from 1980, which boasted only a $550,000 high among lots of four and five figures. 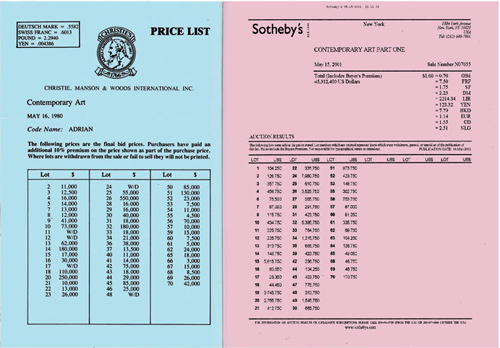 Price List (Trifecta) presents two panels of a confidential record identifying buyers’ names at a 1974 auction alongside a canvas itemizing bidding results from 2007, which set records for twenty-six artists. Without this research, though, the significance of the highly suggestive lists remains factual and opaque, which itself stresses how expensive price tags are divorced from our experience of art. Didactic paintings Auctioneer’s Dream and Well Oiled Machine and the photograph The New 10 Grand—all displaying quotations from newspaper reports repurposed by auction houses for their promotional brochures—eke out a critique, albeit an obvious one. Nonetheless, Lutz’s greatest strength is in generating discussion about value and culture, implicating our obsession with money, power, and prestige.